The Mountain Ninos is Alex's Special Olympics Team. It is coached by two of the most extraordinary people I have ever met. They are both young (well younger than me) and incredibly dedicated to the Special Olympics and to the kids. Cammi has a background in special education and Paul has been involved with the Special Olympics since college. The Ninos have been a team for only three years. It was started by Cammi and Paul who approached the local Coordinator independently of each other, coordinated their efforts, recruited athletes and launched the team. Right now we have nine athletes, give or take, between the ages of 9 and 19. There is so much that has occurred over the last three years - that this can serve only as an introduction. The Special Olympics and the Mountain Ninos are interwoven into our lives and are now a part of us. At first, I was a bit confused about the whole Special Olympics system - but in the last three years I have learned the routine. Sports events happen all four seasons of the year. For us, the big seasons are winter and spring. Alex's team bowls in the fall, and practice is on Saturdays for two hours at a local bowling alley. But, in the fall we usually compete in the regionals, and not the state games. During the winter season the athletes on our team either snowshoe or ski. The kids will practice once a week, and since one practice is usually on Saturdays and one on Sundays this give them the opportunity to attend both practices. They can only compete in one discipline however - but as I say - the more exercise the better! The first competition is usually in February and will be at one of the smaller ski resorts in the area. Alex is a slalom skier - and for the past few seasons has won gold or solver medals - she is VERY fast. Special Olympics has a philosophy to award all the competitors in some manner. The competitions are broken into flights and the flights have sub flights. In some cases, Alex will only be competing with one other athlete - thus a silver medal is guaranteed. In larger flights there will be medals and ribbons. Every event has a podium ceremony - and although this is very tedious for us in the audience - it is worth the commitment to see the athletes shine. After the regional games, the teams are invited to send all or some of their athletes to compete in the state games. If Cammi and Paul do not have enough allocations to include all our athletes they will sit down with the team and explain the situation. Sometimes families will not be able to attend because of time commitments - but other times some of the kids that want to go will not be able to attend. This has never been a problem, as our coaches have explained the situation in a way that makes the athletes feel good. Wish I could do that as a parent! State games are really fun - for everyone. There is usually a dinner and dance on the first night. Alex loves singing and dancing (more about this later) so this is one of her favorite parts of the event. She meets athletes from other teams and they have become friends. Over the last couple of years I have noticed the same suitors competing to be on her dance card. There are opening ceremonies, the competitions, the awards ceremonies and Olympic town - usually indoor games and give-aways. These weekends are some of the funnest and most rewarding in Alex's short life. As a Mom, I am so fulfilled to see Alex so happy, so successful and so proud of her achievements. The spring season is set-up in the same format. It includes track and field and swimming events. Alex is a sprinter and this year at the regionals she medaled in the 100 meter dash, the 4 x 100 relay and the softball throw. At the regionals this year I decided to run in the field next to Alex as she was competing. I sort of fancied myself a fast runner - but I got dusted by my 16 year old daughter with down syndrome. A bit humbling - but not surprising! We did not realize at the time - but the State games were the qualifiers for Nationals. The athletes who got gold medals became eligible to have their name picked to compete in Lincoln. Alex won two gold medals - so had twice the chance - and here we are - blogging away - and going to Lincoln, NE next July! It is very difficult to put into words how much the Special Olympics have meant to Alex and to us. Her coaches are professional, yet empathic and caring. They do not put up with some of the behaviors that I know Alex gets away with at school. Cammi and Paul treat each and every kid as an athlete first, and then if needed, as an athlete that may need accommodations. Our coaches are cued into our kids and talk to them as people when issues arise. I must admit, there have been a few times when Paul or Cammi will call me and say "we need to sit down with Alex and talk about"....But we do - and she listens. Once again - I know there is a reason for everything. 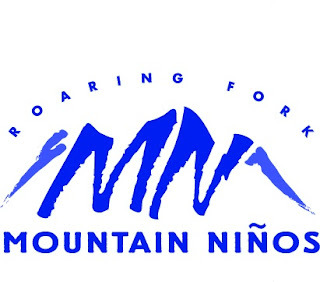 The first season of the Mountain Ninos was also our first season in our new home. We have been involved ever since and it has enriched our lives tremendously. As with Alex's birth, her riding, and so many other things in our lives - is this coincidence or karma? I go with karma.